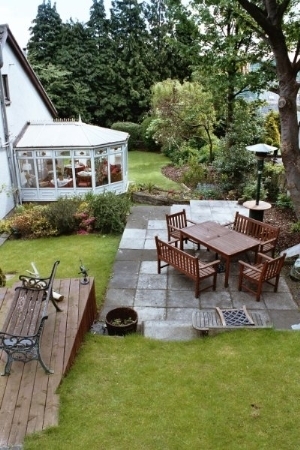 Looking for a homely place to stay for that cycling or walking weekend, or maybe you have a short business trip to the Edinburgh - Fife region? Well look no further - we have facilities to suit all our guests. From the child looking for that secret garden and the seven dwarfs to a business trip with free Internet access. 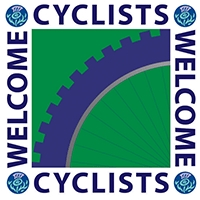 We are very popular with cyclists, walkers and tourists as we are close to the Fife Coastal Path and 2 minutes from the mainline railway of Inverkeithing. Thinking of visiting Edinburgh - then you are only 20 minutes from the centre of Edinburgh! If you stay with us, you can also travel light as we have hairdryers, trouser presses, hospitality trays, full entertainment centres and even an ironing board and iron in each room! The Roods is an award winning B&B. For business guests our unique facilities within the bedrooms mean free unlimited internet access from laptops. Your business associates can call to your room's phone, saving mobile costs. You can call any UK landline to make advance reservations or arrange business meetings. Use our desks with desk lights to prepare for your next meeting. For vacation guests on special week-end breaks or overnight stay or part of a well earned annual break , there is something for everybody. You can travel light as we provide hairdryers, trouser press, hospitality tray and fruit bowl, tv/dvd/freeview, dvd library, radio alarm iron and ironing board. We'll even slip a weather report under your room door!!! Use your personal phone to let somone know you've arrive safely or call to make your next reservation enquiry. Both our ensuite bathroom/shower rooms are spacious and luxurious and are filled with lots of toiletries for you to use, fluffy towwels and bathrobes. In the summer take your tea/coffee onto one of our patios listening to the gurgle of our own homemade burn or watch and listen to the many birds that visit our garden. For the children there is the Secret Garden, full of fairies and gnomes complete is a tiny chalet and snow white and the Seven Dwarves.